This Brooklyn maternity session was so relaxed and fun, which helped me create beautiful, loving maternity portraits for this gorgeous mama to be. 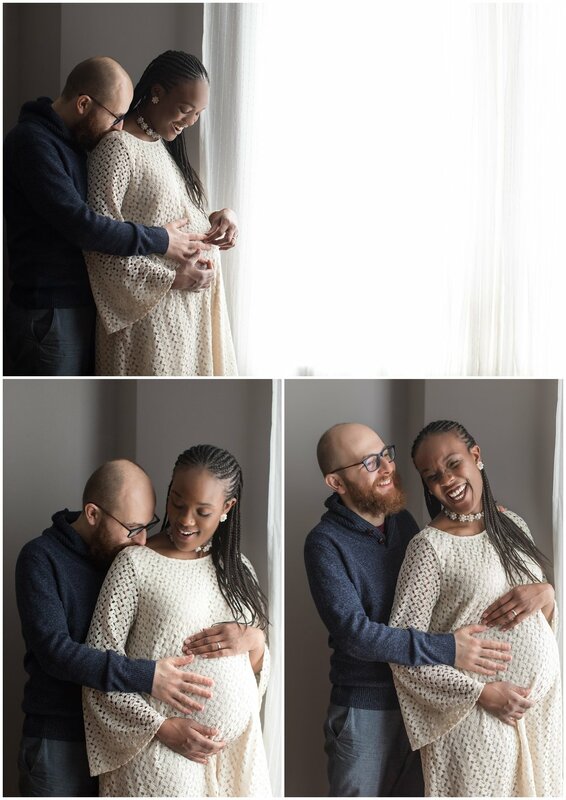 Mom opted for a lifestyle maternity session inside her lovely Brooklyn home. Sometimes, New York City clients worry that their homes do not have enough light for in home lifestyle photography due to the often long, narrow layout of their apartment or home. I always assure them that this is never an issue for me because I find beautiful light every home and often bring professional lighting equipment to supplement natural light or create my own light when need be. Mama had beautiful natural style, which made this session very easy to plan for us both. During her consult we discussed a number of outfits she had in mind and I helped select flattering options that would photograph well. Mama was also excited that I offer a Studio Wardrobe so I brought a few options based on her styling preferences. My Sew Trendy gowns allowed mama’s beautiful form to shine and and we created an incredibly diverse gallery to document this beautiful time in her motherhood journey. We are all now anxiously awaiting the arrival of their sweet baby boy, when I'll get to meet the whole family again for a studio newborn session. Here are a few favorites from this beautiful day.